Ex-MPs can travel free in AC First Class of any train when travelling alone, and in AC Second Class with a companion, both for free. Last week, a public interest litigation challenging the validity of pension benefits to Members of Parliament came up before the Supreme Court. The court has asked the government and the secretariat of the two Houses of Parliament to give their replies on the issue. The apex court’s intervention drew sharp reactions in both Houses, and the Union Finance Minister made an unequivocal statement specifying that only Parliament has the competence to decide on the issue of entitlement and quantum of pension to MPs. From May 2009 (beginning of the 15th Lok Sabha), ex-MPs have received a pension of Rs 20,000 per month. MPs who have served for more than 5 years receive an additional Rs 1,500 per month for every year they have been in Parliament in excess of 5 years. Ex-MPs can travel free in AC First Class of any train when travelling alone, and in AC Second Class with a companion, both for free. On the demise of an ex-MP, their spouse or dependent receives a family pension which is half of the pension to which the ex-MP was entitled. Ex-MPs are also entitled to receive medical treatment under the Central Government Health Scheme (CGHS). Lastly, they can borrow books from the Parliament library by paying a security deposit of Rs 500. However these benefits have not always been available to MPs. Article 106 of our Constitution gives Parliament the authority to decide the salaries and allowances of MPs. In 1954, when Parliament specified the salaries and allowances of MPs, the law did not have a provision for pension benefits for ex-MPs. More than 22 years later, the law was amended in 1976 to provide a pension of Rs 300 to ex-MPs. Under the law, an ex-MP who had served for more than 5 years was entitled to an additional pension of Rs 50 per month for each extra year served, but the total pension was capped at Rs 500 per month. Also, pension benefit were made available only to MPs who had served for at least 5 years. While MPs’ monthly pension was revised over the years, the eligibility criterion of serving for a minimum 5 years remained in place until 2003, when the law was amended to remove this condition. It was estimated that by then, this provision had denied pension to approximately 764 Lok Sabha MPs and more than 200 Rajya Sabha MPs. The other significant amendment to the law came in 2006. Until then, a deceased ex-MP’s spouse or dependents were entitled to receive only family pension for a limited time. 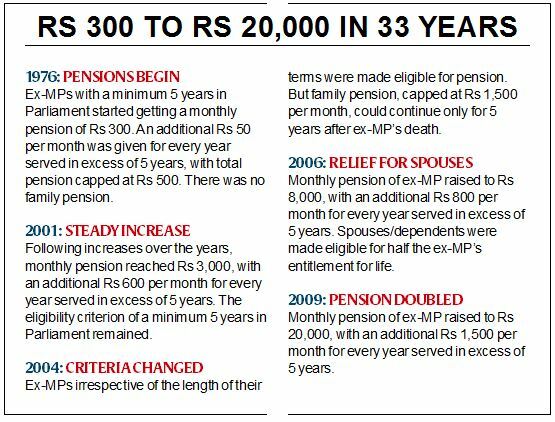 The 2006 amendment gave them the security of family pension to the tune of half of the ex-MP’s entitled pension for life. The current debate around the pension entitlements of MPs raises two significant questions. First, should MPs as the highest legislators decide their own salaries, allowances and pensions by passing a law in Parliament? Does this not create a conflict of interest? The law governing the emoluments of MPs provides for a Joint Committee of Parliament to recommend changes in their salary and allowances. This Committee has been cognizant of this issue. The Committee had recommended in 2005-06 that the government should consider a permanent independent mechanism for recommending changes in the salaries and other benefits of MPs. This recommendation has been accepted by the government. A similar structure exists in other countries. Since 2010, the salaries of MPs in the UK have been determined by the Independent Parliamentary Standards Authority, a body that was set up in the wake of a scandal in which MPs were found padding their expenses and illegally claiming them from Parliament. The second, and more fundamental issue is whether the benefits that are provided to MPs are (i) adequate for them to perform their duties and, (ii) attractive enough for interested and committed individuals to join politics. This zooms the debate out into a far wider field, and opens up many related issues that concern the current nature and understanding of politics itself.